Disclaimer: The ideas, views, and opinions expressed in this article are those of the authors and do not necessarily reflect those of the City of North Adams, North Adams Historical Society, or Save Fort Massachusetts Memorial. Halfway between Williamstown and North Adams, Massachusetts, there lies hidden and long forgotten, a vague marker on a small boulder, at the back end of a nearly vacant parking lot, commemorating Fort Massachusetts and its defenders. There is nothing there telling us what war this fort was built for. And nothing telling us what had actually taken place on this site––only that there must have been some conflict between the fort's inhabitants and, presumably, their enemy: a “scene of their struggle in the wilderness,” as the plaque indicates. But nowhere does it tell us what that struggle was. To the left of this commemorative boulder, there is a fireplace and chimney. It is what remains from a replica fort that was built there in the 1930's, by the Fort Massachusetts Historical Society. 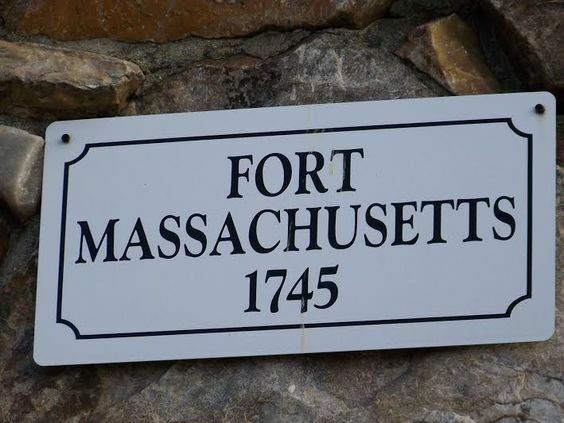 On what would be the outside of it, there was once a small sign that read, “Fort Massachusetts 1745”––that would have shed some light on the fort's construction date. However, in 2016, even that minuscule clue would be denied to present-day visitors to the site because that sign had been stolen. What the boulder's plaque commemorates is the siege that took place there during the French and Indian Wars––in observance of the thirty brave individuals' trials and tribulations during the siege and captivity of the fort's inhabitants by the French and their Native American allies in 1746. But there was much more to Fort Massachusetts than the Siege of 1746. There were ambushes, brief firefights, and one more attack where they successfully defended the fort and succeeded in driving off the enemy. The first British Settlers in this area were the soldiers and their families, helping to clear the way for further European settlement into this region. In fact, in the spring of 1746, one of the soldiers, John Perry––a carpenter by trade, who helped construct this and other nearby forts––picked himself out a plot of land west of the fort, further along the Indian trail, and built a house on it for he and his wife. After the siege, it was pillaged and burned to the ground along with the fort. Some of the original proprietors of the township of West Hoosac––now Williamstown––were soldiers of the fort. there at Fort Massachusetts––was the first cemetery in the northern Berkshires. Fort Massachusetts was located in the western frontier of Massachusetts Bay, in the township of East Hoosac, upon a meadow of the Hoosac River, in current day North Adams. It was the westernmost bastion in the northern line of colonial forts, extending from the Connecticut River, over the Hoosac Mountain, to this western frontier during King George's War (1744-1748), in 1745, against the French and their Indian allies. It was also built to prevent Dutch settlers in New York from encroaching upon Massachusetts territory from the west. The Williams family were the creators and maintainers of the line of forts, with Ephraim Williams Jr. in command. The fort remained active throughout much of the French and Indian War (1754–1763), until 1759, when it was decommissioned following the Battle of Quebec. After the boundaries of the two townships had been surveyed in April of 1749, then designated as "East Hoosac" and "West Hoosac", village lots were then established the following year by a committee appointed by the General Court. In West Hoosac, the committee was required, by law, to reserve three house lots, "one for the first-settled minister, one for the ministry, and one for the school, as near the centre of the township as may be with convenience." Chance, determined by the number drawn, determined the location of each man's purchase. The first actual settlers upon any of these lots, who were also original proprietors of the same, were soldiers at Fort Massachusetts. In Colonel Ephraim Williams Jr's. will, he included a bequest to support and maintain a free school to be established in the town of West Hoosac, provided the town change its name to Williamstown. Not long after its founding, the school's trustees petitioned the Massachusetts legislature to convert the free school to a tuition-based college. The legislature agreed, and on June 22, 1793, Williams College was chartered. It was the second college to be founded in Massachusetts. And Williams College is regarded as a leading institution of higher education in the United States. Ephraim Williams Jr. resigned his command at Fort Massachusetts in 1755, and Isaac Wyman was at once appointed to succeed him. When the fort was decommissioned, following the Battle of Quebec in 1759, Captain Isaac Wyman is known to have lived in the house within the pickets and to have occupied the land. Then, in 1762, the General Court sold at auction the entire township of East Hoosac to Nathan Jones, who had become one of its three proprietors (the others being Colonel Elisha Jones and John Murray). Israel Jones, son of Colonel Elisha Jones, became the proprietor of the farm in 1766, where he remained until his death in 1829.
continued to cultivate the hallowed meadow. Although it had been brought up in the early eighteen hundreds, it wasn't until 1859 that the site was properly acknowledged with the planting of a memorial tree, an elm tree, by Professor Arthur Perry of Williams College––aptly referred to as Perry's Elm. It was planted in what was the middle of the parade-ground within the original fort. In 1896, the Fort Massachusetts Historical Society was formed for the purpose of preserving the identity of the site of Fort Massachusetts. And, having learned that Mr. Clement Harrison's heirs were selling the land, they raised the funds to purchase the portion of the site where the fort once stood, the following year. In 1897, a flagstaff was raised upon the site by the Society. The flag was drawn to its place by Professor Lewis Perry, of Williams College, son of Professor Arthur Perry, who forty years before had planted the commemorative elm. The Daughters of the American Revolution, Fort Massachusetts Chapter, provided a pennant for the flagstaff. The Society then began raising funds to reconstruct a replica fort as a memorial to the site. The new fort was erected by WPA workers during the Great Depression and was dedicated in 1933. It operated as a historical tourist site into the 1950's. It featured the headstone of Elisha Nims, a soldier killed at Fort Massachusetts, set into a fieldstone cairn, and placed within the replica of the fort. The walls of the fort enclosed Perry's Elm––by then a stately, majestic tree. But, in 1952, the Fort Massachusetts Historical Society was forced to sell the property because of its inability to maintain the stockade and its garrison house––despite the disapproval of the Daughters of the American Revolution. The replica of the fort would serve as a restaurant––Fort Massachusetts Restaurant. In 1960, the Golub Corporation bought the property. William Golub, president of the Central chain, said that every effort would be made to preserve the memory of Fort Massachusetts. Though the replica of the fort would be cleared away, Perry's Elm remained along with Elisha Nims' cairn. However, at some point prior to 1976, the cairn was relocated. The headstone has since been removed. In 1976, the Fort Massachusetts Chapter of the Daughters of the American Revolution set a boulder on the site with a bronze tablet commemorating the fort and its defenders. The memorial sits beside the tall fireplace and chimney left over from the Fort Massachusetts replica. Gradually, the site fell into ruin. And Perry's Elm fell victim to Dutch Elm Disease. With the closing of the former Price Chopper in February of 2016, there had been some concern as to the fate of the site. 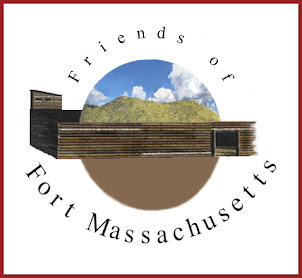 And, once again, a few members of the community formed a group to advocate for the preservation of this historic site, called the Friends of Fort Massachusetts. Their vision was to preserve the site as a public park––The Fort Massachusetts Memorial Park. The group would later evolve, under new direction, into Save Fort Massachusetts Memorial, Inc., under the umbrella of the North Adams Historical Society. Then, in 2017, with the joint efforts of all parties, the Golub Corporation donated the site to the City of North Adams. The site of Fort Massachusetts may have been well chosen for the ends for which it was built, but as the area was developed––a railroad line was laid through the property and businesses filled in around it, ultimately consuming it––prospects for preserving the identity of the site looked bleak. And no formal preservation plans or policies were implemented to protect this historic site since it had been privately owned. We are fortunate to have had the previous owner preserve this site, allowing for a small marker to be placed there, and the annual ceremony, commemorating the siege of 1746 (although, the ceremony was not always performed at the site, as in the last few years). Despite this, the fort has been all but forgotten. There is any number of reasons why this site has been neglected, but to dwell on them would be a waste of time and energy, which could be better spent exploring some of the many possibilities and opportunities to help generate a renewed interest in the revitalization of this historic site. There are just as many opportunities as there are challenges for this park to receive the care and attention that it deserves. It is too far from any tourist attraction to be traveled to by foot. Finding the site has also been an issue for a number of visitors since there are no street signs directing them to the site––nor is it on any current tourist or cultural maps. Once the visitor does find the site, there is no informational sign describing the history of Fort Massachusetts. It needs to be designed as a park. Being tucked away between a parking lot and businesses, the view from the site isn't exactly picturesque. At present, it looks more like an abandoned site. Bicycle and Pedestrian Path -- In 2007, Williams College students conducted a Mohawk Bicycle and Pedestrian Path: A Roadway Feasibility Study, for Lauren Gaherty, the Senior Planner with the Berkshire Regional Planning Commission. Such a project would create an opportunity for a recreational commute between North Adams and Williamstown, connecting such attractions as the Clark Art Institute, and the Williams College Museum of Art in Williamstown with the Massachusetts Museum of Contemporary Art in North Adams. Finding the Site -- In a dissertation written by Kate Kachovec submitted to the Faculty of the Historic Preservation Program of the University of Maryland, College Park, titled "Historic Sites & Signage: Commemorating Lost and Intangible History," she wrote: "Historic markers are one of the oldest approaches to recognizing and interpreting a historical personage, site, or event at a specific location. However, a particular challenge exists when the person, site, or event is no longer represented by a physical resource. In these cases, the marker or signage must literally stand in for the original.... The success of these types of projects is critical in that they inform the community about a past that otherwise would become lost. Historic sites that have no physical representation are arguably the most important sites to mark and commemorate because they are at the greatest risk of being forgotten or lost. Without these intangible historic sites, communities lose an important sense of place that enhances the environment." Information Board -- There needs to be an information board center at the site, briefly describing the site's history. And it should utilize technologies available to us, such as the Open Heritage project, QR codes, or apps such as OnCell,––just to name a few––to be included with the information to help visitors engage in its history in a way not possible in the past. Make it Look Like a Park -- Create an open space, extending from the area around the memorial, and in the front portion of the lot. Remove deadwood, and prune trees and brush. And install a couple of park benches and a picnic table (Inground / Surface Mount.). Include some additional signage stating that smoking, and littering, are prohibited. And have a Carry-in/Carry-out policy. In addition to the annual commemorative ceremony on the anniversary of the siege of Fort Massachusetts held in mid-August, create other annual events, like a spring clean-up day, "Fort Day" (a family summer event, featuring period costumes, a musket demonstration, storytelling, live period (folk) music, etc. ), fall clean-up day, and perhaps a "Snow Sculpting in the Park Day," in the winter. Links and Social Shares -- Add any future associated website link (whether that be through the North Adams Historical Society or one created by the Save Fort Massachusetts Memorial) to such websites as the North Adams Chamber of Commerce's website, to be included in the Historical category of their website, since the historical society is a member. (The Massachusetts Cultural Commission awarded North Adams the prestigious Cultural District designation last year, and are thus linked statewide.) And connect with other historical societies and related social media sites. Local Historical Societies -- Partner with other local historical societies, such as the Williamstown Historical Museum, the Adams Historical Society, and the Berkshire Historical Society on events and lectures. And with the Heath Historical Society (Fort Shirley), and the Rowe Historical Society (Fort Pelham). Local Historic Sites -- Partner with other related historic sites. For example, with the Natural Bridge State Park, with the brook that flows through its gorge named after one of the soldiers of Fort Massachusetts; the ties with the historic site of the West Hoosac Fort blockhouse, erected in 1756, in Williamstown. And connect with the Hoosic River Watershed Association, dedicated to the restoration, conservation, and enjoyment of the Hoosic River and its watershed, through education, research, and advocacy. And work with other forts from that time period, such as with the Fort at Number 4, in New Hampshire. The Descendants of the Soldiers -- Reach out to the descendants of the soldiers once stationed at the fort (for example, The Nims Family Association) and share their stories. Treasure Hunting with GeoCache -- Geocaching is a real-world, outdoor treasure hunting game using GPS-enabled devices. Participants navigate to a specific set of GPS coordinates and then attempt to find the geocache (container) hidden at that location. There once was a cache placement on the site. As a matter of fact, it's what spear-headed a major clean-up of the site in 2012, trail-blazing the way to help preserve the site as a park. After a former employee of Price Chopper discovered the placement of a geocache within the forested portion of the site and saw what seemed like decades worth of trash and overgrown foliage, there was only one thing that she could do. You can read all about it HERE. Public Art -- Partner with MASS MoCA to commission an appropriate, site-specific art installation for the site. Maybe an installation that could also serve as an informational board? It's certainly something to look into. Farmer's Market or Craft Fair -- Hold a farmer's market or craft fair at the site. As an example, the Fort Brewerton Historical Society, in Brewerton, NY, oversees a farmer's market every Friday. Wayfinding -- Partner with other historical societies and organizations in the county to create a “wayfinding” program whose aim is to install signs and pedestrian kiosks to direct visitors and residents throughout the northern Berkshires to distinctive recreational, cultural, and historical attractions. Site excavation -- Consider having the site excavated (for example, by the Archaeological Services at the University of Massachusetts Amherst Department of Anthropology.). God's Acre -- There are at least fifteen people documented that were buried there (Elisha Nim's remains were reinterred in Hillside Cemetery.) In an article titled, "The “Bone Finder”, ground-penetrating radar was used to locate lost graves. Robert Perry located 2,700 unmarked graves and buried headstones on the grounds of Washington’s Historic Congressional Cemetery, in Washington, D.C. His services would be most helpful in locating the soldier's remains. Funding -- Funding for these projects can be made by donations, fund-raising efforts, and through other funding and grant sources allotted to the preservation of historic sites, such as the Preservation Massachusetts, the National Trust for Historic Preservation, and the Daughters of the American Revolution, just to name a few. Funding resources for public art can be found at the Mass Cultural Council, MASS Creative, and Americans for the Arts, again, just to name a few.